I was always a rather small cog in the wheel of American journalism, yet I was lucky in meeting notable and accomplished people. I sought them out whenever the opportunity arose, wanting more than anything to hear the stories of how these extraordinary people succeeded and how their thought processes worked. I was lucky at the very beginning of my journalism career. 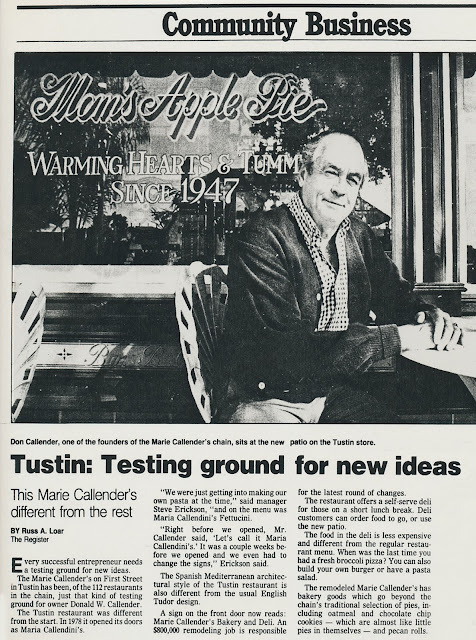 I’d only written a few stories during my internship in 1984 at The Orange County Register when the editor suggested I write a story about a newly remodeled Marie Callender’s restaurant in Tustin, California, nearing completion. After contacting the restaurant manager, she mentioned that the founder of the restaurant chain, Don Callender, would be at the restaurant in a few days and I could interview him then. I jumped at the chance. When I walked into the restaurant for my lunch meeting with the 57-year-old Don Callender, he eyed me suspiciously until I told him I was the reporter from The Orange County Register he was expecting. He said, “When I saw your shiny shoes I thought: Oh no, here’s another one of these guys from the city." He said shiny-shoed city inspectors were making it difficult for him to open the remodeled restaurant. Callender was generous with his time as we ate lunch, telling me how his parents, Cal and Marie Callender, began a wholesale pie business in 1947 to help supplement the trailer park family’s meager income. They operated out of a rented 20-by-20-foot Quonset hut in Long Beach. Callender delivered his mother’s pies on his bicycle. The first Marie Callender’s coffee and pie shop opened in 1964, in Orange. In 1986, Callender sold the chain of 120 restaurants to Ramada Inc. for a reported $80 million.